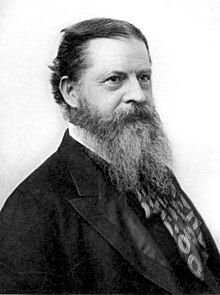 Charles Sanders Peirce (/ˈpɜːrs/, like "purse", September 10, 1839 – Aprile 19, 1914) wis an American filosofer, logician, mathematician, an scientist who is sometimes kent as "the faither o pragmatism". ↑ Stigler, Stephen M. (1978). "Mathematical statistics in the early States". Annals of Statistics. 6: 239–265 . doi:10.1214/aos/1176344123. JSTOR 2958876. MR 0483118. ↑ Crease, Robert P (2009). "Charles Sanders Peirce and the first absolute measurement standard: In his brilliant but troubled life, Peirce was a pioneer in both metrology and philosophy". Physics Today. 62 (12): 39–44. doi:10.1063/1.3273015. ↑ Cadwallader, Thomas C. (1974). "Charles S. Peirce (1839-1914): The first American experimental psychologist". Journal of the History of the Behavioral Sciences. 10 (3): 291. doi:10.1002/1520-6696(197407)10:3<291::AID-JHBS2300100304>3.0.CO;2-N.
↑ "Peirce", in the case of C.S. Peirce, always rhymes with the English-language word "terse" and so, in most dialects, is pronounced exactly like the English-language word " purse (help·info)". See "Note on the Pronunciation of 'Peirce'", Peirce Project Newsletter, v. 1, nos. 3/4, Dec. 1994. This page wis last eeditit on 2 Februar 2016, at 23:23.